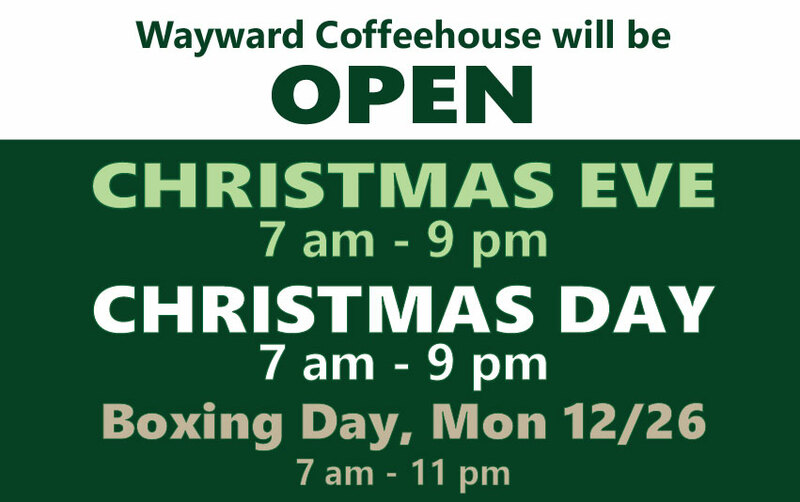 Wayward Coffeehouse will be OPEN on Christmas Eve and Christmas Day. We love being able to spend the holidays with our wonderful Wayward community and also recognize that our fabulously diverse community celebrates different holidays throughout this magical time of year. We know that all of you have different traditions and different circumstances and we are proud of being able to provide a welcoming space for our community every day of the year. Please join us for good cheer, great company, and delicious coffee. No matter what holiday you celebrate, whether it is the Winter Solstice, Hanukka, Kwanzai, Christmas, or the opening of the ski slopes, we hope you spend it with loved ones for a season of love, happiness, compassion, and gratitude. We look forward to seeing many of you on all these winter holidays!